A Sytner dealership in Tamworth has been named Mini retailer of the year as the brand recognised its best talent at the 2017 Mini Retailer Awards. Sytner Tamworth Mini was the headline winner of the evening, the dealership team bagging the prize after delivering exceptional work in a range of areas including new and used car sales, profitability and customer satisfaction. The Mini Retailer Awards recognise “exceptional results” from teams across the BMW-owned brand’s 141–site UK retail network. The Tamworth team were also the first to start using Mini’s new corporate branding which has been rolled out over the retail network over the past year. Other winners included Cooper Norwich, awarded for aftersales performance, Harry Fairbairn Giffnock for used car sales and Prentice Portadown for delivering “consistently excellent” customer service. Rybrook Shrewsbury took both the financial services and manager of the year awards. 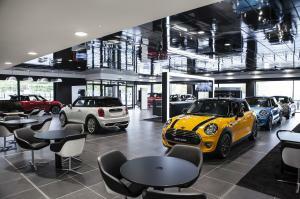 Last year Mini sold 68,984 cars in the UK, its best performance since launching in 2001. The brand “significantly outperformed” the new car market, driven by sales of the Mini Convertible, the best-selling convertible in the UK. Winning a prestigious award like retailer of the year is bound to be of great PR benefit. Dealerships looking forward to welcoming additional customer footfall are urged to keep an eye on their stock levels and review their motor trade insurance accordingly.